The form of Anthony Martial (£7.6m) is beginning to challenge the perceived wisdom concerning Manchester United midfielders among Fantasy Premier League managers. 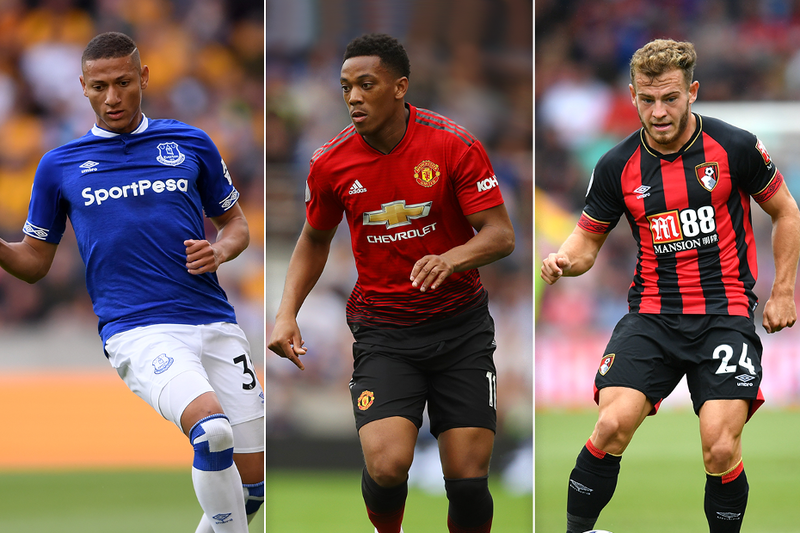 The FPL panel of experts discussed whether the Frenchman is a worthy replacement for rivals such as Richarlison (£6.9m), Ryan Fraser (£6.2m) and Bernardo Silva (£7.5m) or even premium-priced midfielders. Mark McGettigan (@FPLGeneral): Martial has a very good chance of being in my squad for Gameweek 13. He’s got the form and the fixtures. Richarlison is another mid-priced midfielder on my "most wanted" list. Ben Crabtree (@FC_CrabDogg): I like Martial a lot but am a bit stuck fitting him in. I don’t want to lose Richarlison or the cheaper Fraser. If Martial keeps scoring like a premium midfielder, he could force a question mark over Eden Hazard (£11.3m) in my thinking. Paul Gee (@fplPaulGee): Martial is a great pick but his goal against Man City was a penalty and Paul Pogba (£8.0m) will likely be back after the international break to take over duties. I have gone with a Richarlison and Gylfi Sigurdsson (£7.5m) double-up because I don’t think they will be rotated over the congested fixture list. Josh, Always Cheating #FPL Podcast (@hailcheaters): There’s been a strong aversion to having any midfielder from Jose Mourinho’s Man Utd over the last couple of seasons, so the biggest hurdle right now might be a mental one. Based on his recent results, and that we know he’s a talented player capable of this level of performance, he’s a great option. Plus, his fixtures are better than Richarlison’s. WGTA (@WGTA_FPL): We’re in team structure, "Can’t have ’em all" territory here. If you can fit him smoothly in, he’s looking a great pick at £7.6m, but if it requires squad surgery, give it careful thought. Neal Thurman (@nealjthurman): He could be a good replacement for Fraser, as AFC Bournemouth have tough fixtures ahead and Man Utd have a fairly easy run until mid-December. I’d go with Martial for the next month if the money works for you. Ash (@FPLHints): Despite United's indifferent start, Martial has shown his proven pedigree. He’s still something of a differential who is becoming a must-have. Holly Shand (@FFCommunity): Martial’s form and fixtures mean he cannot be ignored. I have Richarlison and Fraser, though, and can’t see an easy way to fit him in. Sam, FPL Family (@FPLFamily): I was wary of picking Martial through fear of rotation. Although he is a good option, there are strong alternatives: Felipe Anderson (£6.9m) and Fraser are both cheaper and seem just as good for points. For just under £1m more, David Silva (£8.5m) looks excellent for free-flowing Man City. FPL Ben McNair (@drbenmcnair): Martial’s had eight shots on target over the past four Gameweeks. I’m not yet convinced he’ll maintain this consistency, though, as Man Utd’s form still looks fragile. Lee, FPL Family (@FPLFamily): Rarely does a player come along with the perfect FPL storm of form and fixtures. With three of their next four at home and only a trip to Anfield to fear until January, he’ll be in my team for Gameweek 13.